The arrival of cold weather brings the start of the annual battle between those who want to keep the thermostat cranked down just low enough to keep the pipes from freezing and those who think hats and multiple sweaters aren't reasonable indoor attire. If your family finds itself having this feud each year, or you just want to find new ways to get your winter heating bills down, now is the time to switch to a programmable thermostat. The general rule of thumb is that when you raise your thermostat by just one degree for an average of eight hours per day, you increase your energy bills by 1%. If you were to set your thermostat to 70 degrees 24/7 instead of 60 degrees, your energy bills would be about 30% higher. Of course, you may not want to keep your home at 60 degrees at all times, and this is where a programmable thermostat comes in. You can set it to turn itself down when everyone is away at work or school and when everyone is asleep and then have it turn back on in time to warm up the house when they return or wake up. If everyone is away for 8 hours during the day and sleeps for 8 hours, you could still see a 20% reduction in your energy bills without sacrificing your comfort. Most programmable thermostats have four settings for each day : sleep, wake, away, and return. You can set the start and end time for each period according to your schedule. For the sleep and away periods, set your thermostat no lower than 55 degrees to protect your pipes from freezing. You may need to go a little higher if you have sensitive indoor pets or the temperatures are too cold to comfortably sleep in even with blankets. For the wake period, set the start time to an hour before you wake up so the temperature is up when your alarm goes off — it's much easier to get out of bed when your house isn't freezing. For the return period, set it to end about an hour before bedtime — the falling temperature will help you naturally feel ready for bed. Replacing the thermostat for an existing heating or cooling system is easy. The outer casing of the old thermostat typically lifts off the wall, then, unplug the wires, and unscrew the thermostat's base. 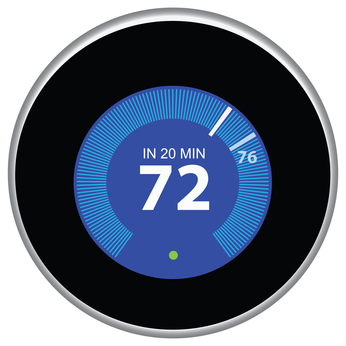 To install the new programmable thermostat, simply perform the process in reverse — the total time takes about 15 minutes. If you don't feel comfortable doing this, or you have a variable speed heating and cooling system that requires further modifications, we'll be happy to make the switch for you either as part of your fall maintenance visit or as a separate appointment. Contact us today to schedule an appointment.